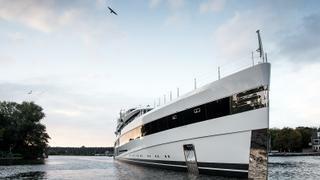 Lady S features exterior design by Michael Leach Design and naval architecture by Feadship De Voogt naval architects. The 93 metre Feadship superyacht Lady S, previously known as Project 814, has been captured underway during her sea trials. 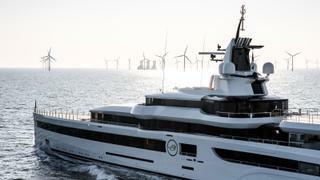 The yacht set out from Feadship's Amsterdam facility on April 1 and was put to the test in the North Sea. This was the second time Lady S was captured on the move having been previously transferred from Kaag to Amsterdam a few weeks ago. The carefully planned operation saw Lady S navigate carefully through various waterways and bridges along the way. Lady S, which has been under construction for five years, was first unveiled on Saturday, October 19 when she was launched at the Dutch yard’s Royal van Lent facility in Kaag. 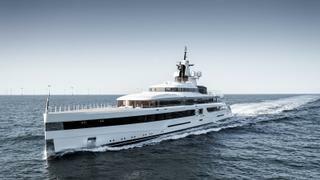 Featuring exterior design by Michael Leach Design and Feadship De Voogt naval architects, Lady S will “set a new standard in luxury,” according to the Dutch yard. While details remain sparse, Feadship has revealed that Lady S has a 14.10 metre beam and a number of stand-out superyacht features. These include a two deck IMAX theatre, fully certified helipad and four VIP cabins. The yacht will also be equipped with a number of sports facilities for golf, basketball, volleyball and football.